Stain (optional) Most stains need to dry overnight. White, black or pastel stains need to dry for 72 hours depending on the weather. This is where most homeowners get confused because if you ask 10 floor finishers what to use you will get 10 different answers. After being in this business for 30 years, we've tried nearly every product you could possibly imagine. There are many finishes on the market today, but let us focus on the 2 kinds that we recommend. 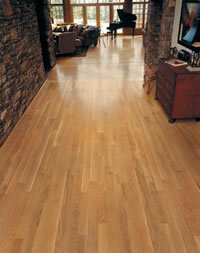 If we are supposed to apply a stain to your wood floors, then we need to know the exact color. If you are unsure as to the color you wish to use, please make arrangements for someone to be at your job site on the first day of the sanding process so that we may do a stain test for your approval. If this is not possible, please notify the office so that we can arrange for the test to be done at a more convenient time. When staining dark colors, it is virtually impossible not to get a minimum amount of stain on your door jams, spindles, side skirts,etc, so please be prepared to do some touch up painting. Also, when changing colors from very dark stain to natural or light stain, it is impossible to remove all the dark stain from open grain areas, especially where hand scrapping is involved. Note: Some nail holes that are black, due to the fact that they have gotten wet in the past, will not sand out. Lady Baltimore Floors offers a full line of trim - specializing in baseboard, crown molding, chair rail, recessed panels and door / window casing. Trim comes in a variety of solid wood species, which we finish to either match your new floor or provide primed material ready to paint. While completing your flooring project, installing decorative trim will add aesthetic value to any room. Lady Baltimore Floors now offers ceramic tile installation. The customer is to supply the tile and grout and we will supply the labor and underlayment in order to install the tile and trim needed. We have an account with Mosaic tile in Owings Mills Maryland (410-902-8453. If you choose to purchase your tile there, you will receive our contractor discount. Additionally, Lady Baltimore Floors has teamed up with licensed, bonded, and insured contractors which we highly recommend to provide any work on electrical, plumbing, carpet, cabinet making, painting, and a variety of other phases of remodeling. These contractors have been hand-selected over our 32 years of serving many satisfied customers. Extending these contractors expertise allows us to better serve homeowners and ensure a great finished product. All services listed above including hardwood floor refinishing, hardwood floor sanding, hardwood floor staining as well as new hardwood flooring installations are available to residential homes and commercial businesses throughout the Baltimore Maryland area.